Why, 21 years after the Good Friday Agreement, does religion still divide the people of Northern Ireland? The peace walls of West Belfast snake through the city, adorned with colourful street art and murals. Buses and taxis pull up to let cheerful tourists write their messages of hope and love on the bricks. Their purpose is not to celebrate peace, it is to keep the peace. From one direction, past the loyalist murals of the Shankill Road, comes 16-year-old Rebecca. From the other, walking alongside the republican murals of the Falls Road, 14-year-old Naomi. Each passes through the metal security gates into the no-man's-land that divides the two communities. They meet, and they embrace. "It is not often that two people from two different communities could be able to come together and have such a good friendship," Rebecca tells me. "We are one of a kind," jokes Naomi. Like 93% of children in Northern Ireland, they go to predominantly segregated schools and live in predominantly segregated communities. For a child in Belfast to have a friend from the other side of the wall is still shockingly rare. If you want to find a true message of hope at the wall, it is the friendship of Naomi and Rebecca, two young people who would never have met if it was not for those working to bring peace to this land. I was in Belfast 21 years ago to report on the signing of the Good Friday Agreement, with optimism in the air and excitement about how Northern Ireland might spend its peace dividend. Reflecting, I am struck by how divided and nervous the place remains. The walls erected to reduce sectarian violence are not only still here, they are longer and they are higher than ever. Each evening, iron gates between the Shankill Road and the Falls still clang shut. With divisions over identity deepened over Brexit, the peace process remains an urgent priority. As part of the BBC's Crossing Divides season, I have come to see what is being done to heal the rift that physically and psychologically scars this land. In the last quarter of a century, billions of pounds have been spent on peace programmes in Northern Ireland and along the border with the Republic. The latest iteration, Peace IV, focuses on children and young people, trying to ensure that the bigotry of the past is not inherited by the next generation. Naomi and Rebecca are on a Peace IV scheme run by education provider Springboard. Teenagers from disadvantaged communities in Belfast are introduced to their neighbours, across the wall. They visit each other's schools, learn together and play together. For most of those on the course, it is the first time they have ever spoken face-to-face with someone from the other side. "Before Springboard, I was always told that Catholics were bad people compared to Protestants," says one. "But not all Catholics are like that - they are actually mostly like us." A Protestant girl explains to the group: "I never knew anybody from the other community. I never spoke to anybody from the other community. Now I do. I speak to them every day." There is almost bewilderment at how the narrative of distrust and suspicion played to them throughout their lives fails to stand up to scrutiny. "It's just the way they were brought up and we were brought up," a boy says. "Their families are telling them different things, but we are just all the same." Leaning against the peace wall on the Catholic side, 22-year-old Conor Loughlin, a graduate of the Springboard scheme, tells me about the first time he ventured into the Protestant neighbourhood just a minute's walk away. "It was so, so hard. Even though it is the same road, you get shivers and stuff." Conor remembers how he was greeted at the security gate by Sammy, a Protestant lad he had got to know on the course. "That was amazing, someone just coming and saying, 'OK you are safe'. That there was just one of the best moments for me. I'd never had a Protestant looking out for me and they actually cared about me." The course is about much more than just bringing people together and hoping they get along. "We break down the prejudices and stereotypes they carry with them from the communities, from the families, from the legacy of The Troubles," project leader Stephanie O'Rourke explains. "It is about talking about the elephant in the room." It is an elephant often ignored in Northern Ireland's school classrooms. None of the young people I speak to has ever been taught about the cultures and traditions of the other community. "They think it might make people more sectarian," one boy reckons. "You don't learn about it. You just learn that the other side is your enemy." In this vacuum, fear and bigotry can thrive. And so, within the current peace programme, there are schemes to confront the reality of The Troubles head on. On the stage at Derry Playhouse, Marjorie Leslie recalls her personal experience of an IRA bombing in the village of Claudy in County Londonderry. "I am taking people back to my house to make tea and we get to the hotel. Whoosh! The first thought that strikes me. I will never hear anyone speak in my life again. This is the end. None of us is going to survive this day." She tells me: "For the first time, I was able to tell what happened, to me and to Kathryn and others in Claudy, 31 July 1972." On that day, Marjorie watched the life drain from eight-year-old Kathryn Eakin, who was among nine civilians killed in the attack. She herself was badly injured. "This play is very important in telling the truth. These are true stories." Half the cast of this Peace IV-funded production have close personal links to the deaths of children in The Troubles, their testimonies weaved into a performance which has proved cathartic for them and the wider community. "Productions like this are the only places where children are going to get this education," says cast member Maria McGavigan, whose aunt Annette McGavigan died aged 14 when the British Army fired into a crowd in Derry in 1971. "You can't listen any more to grannies and grandads telling you Catholics are bad or Protestants are bad. We are all the one," Maria says. Her uncle Martin McGavigan nods, recalling how his sister was killed. "I am nearly 60 years of age and it is as if it happened yesterday. It has to be spoken about," he states. Director and writer Jo Egan believes it is only through the stories of those randomly caught up in "the maw of The Troubles" that Northern Ireland can move forward. "We might not be able to change past events, but we can change how we see them," she explains. "This is the power these stories contain." Changing mindsets is what much of the work of the peace process is about. On a Catholic estate in the north of the city I met parents attending another EU-funded class. 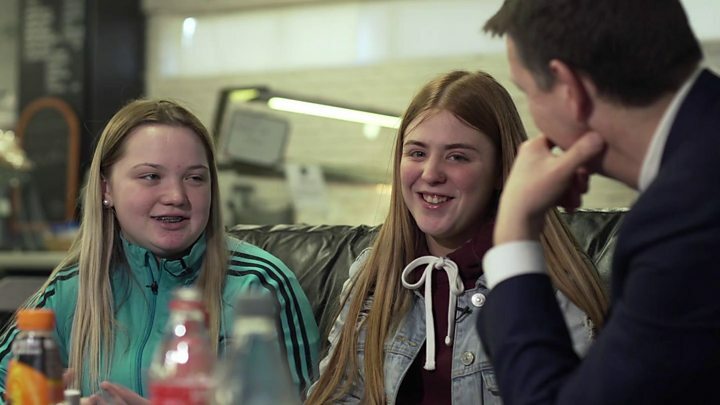 They have heard how children as young as two already exhibit signs of sectarian bigotry and want to ensure their own are not affected by unconscious prejudice. "It has been sort of bred into people," says father of five, James McLaughlin. "This is our chance to break the mould, to open them up to different cultures and religions. Hopefully, they will have a better future because of it." "I would be concerned, because of the way I was brought up, that I just might come out with something," says Jade O'Hagan, whose daughter Ayla is three. "It is also about working on myself. Every day is a learning experience." As little Ayla heads off to put her dolly to bed, gently tucking it beneath a pink blanket, I am left wondering what kind of Northern Ireland she and her children will inherit. Whatever kind of Brexit comes to pass, the EU Commission and UK government have confirmed funding for the peace process will continue. Both know that, while cross-community engagement has improved in the last few years, there is much more to be done. The challenges, like the peace walls, remain high.